This information is applicable only to the customers that are already using any edition of PHPKB 7.0 and would like to upgrade from PHPKB 7.0 to PHPKB 7.5. If you are a PHPKB 7.0 customer with an active support and maintenance subscription, then you can download free upgrade to PHPKB 7.5 from your customer area . You may wish to take a look at PHPKB 7.5 Release Notes to see what is new in the latest version. Please follow the instructions below on how to download the free upgrade. If you have purchased any edition of PHPKB 6.0.x or PHPKB 7.0 software license in last 12 months. If you satisfy any of the above mentioned conditions, you are eligible to get free upgrade to version 7.5 from the customer area of our website. Please login to the customer area with your account details and click on the "PHPKB 7.5 Upgrade" link in the left menu as shown in the image below. If you do not see the link to download free upgrade or if you see the message shown below, it means that you are not eligible to get free upgrade to PHPKB 7.5 however you can still buy the upgrade to PHPKB 7.5. You are not eligible to download free upgrade to PHPKB 7.5 because you do not have an active support and software maintenance subscription. However you can purchase the upgrade to PHPKB 7.5 from "Upgrade Options" link on the left side. You will get 20% discount on normal price being an existing customer. It will open the "Online Upgrade Form" where can select the "Upgrade Type" as "Upgrade PHPKB Edition" and select the upgrade edition you would like to buy. Note : Once you have downloaded the free upgrade package, your download status will be marked as completed and the download link will be removed from your customer area. The free upgrade package of PHPKB 7.5 comes with it’s default layout and features. It is strongly advised not to perform the upgrade if your existing PHPKB 6.0.x or 7.0 package has been customized, modified or changed in any way. If you do it, you will lose all customizations done in your existing knowledge base. We shall not be responsible for loss of any kind. Please proceed only if your PHPKB package has not been modified in any way and the database tables have not been altered from its default structure. If we have customized your PHPKB package, you may contact us to get the same customizations done in version 7.5 for you as a paid job. 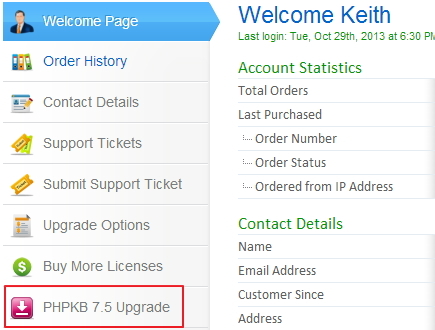 Please refer to the upgrade instructions below on how to perform the upgrade from version 7.0 to 7.5 of PHPKB knowledge base software. For the purpose of explaining upgrade steps, we assume that you have PHPKB 7.0 installed at http://yoursite.com/phpkbv7/ where "yourdomain.dom" is your site/host name "phpkbv7" is the name of existing knowledge base folder. So, please replace these values accordingly while following the steps below. Take Backup : Although no changes are made in the database structure from PHPKB 7.0 to 7.5 yet it is strongly recommended to take full backup of your existing knowledge base folder and its database. Please read " how to take backup of your knowledge base data " article for detailed instructions. Unzip Upgrade Package : Unzip the contents of upgrade package downloaded from the customer area. You will see a folder called "phpkbv7". Please rename it to "phpkbv75" to distinguish it from your existing "phpkbv7" folder. Copy Important Files : Please copy the following items from your existing PHPKB (version 7) folder to the newly downloaded "phpkbv75" folder. configuration.php from "phpkbv7/admin/include/" folder to "phpkbv75/admin/include/" folder. system.php from "phpkbv7/admin/include/" folder to "phpkbv75/admin/include/" folder. All files present under "phpkbv7/assets/" folder to "phpkbv75/assets/" folder. If you are using the multi-language edition of PHPKB 7.0 then copy all languages files except en.php from "phpkbv7/admin/languages/" folder to "phpkbv75/admin/languages/" folder. Change KB URL: After putting the files at their respective locations, now, it is time to change KB URL which looks like this (in "phpkbv75/admin/include/configuration.php"): $path_kb = "http://Your-Domain/phpkbv7"; and change it to $path_kb = "http://Your-Domain/phpkbv75"; . At last, save your changes and exit. You can now login to the admin area of PHPKB 7.5 to see if everything works as expected. Once you are satisfied with the working of PHPKB 7.5, you can discard your previous "phpkbv7" folder. If you have any queries or doubts, please feel free to submit them as a new support ticket from the customer area.